LAPD chose BMW i3 cars after a competitive bid, opting for a three-year lease, enabling it to replace 100 fleet vehicles instead of the original 36. The new arrivals bring the City’s total number of EVs to 168, giving Los Angeles the largest fully battery-powered municipal fleet in the United States, according to LAPD. The new EVs will be part of LAPD’s motor pool, which is largely used by the civilian work force for meetings or site visits, as well as by sworn officers on routine assignments. The vehicles have been added in line with Mayor Garcetti’s Sustainable City Plan, which requires that at least half of all new City vehicles be electric. The deal also includes maintenance as well as training and certification of LAPD mechanics on electric vehicles. 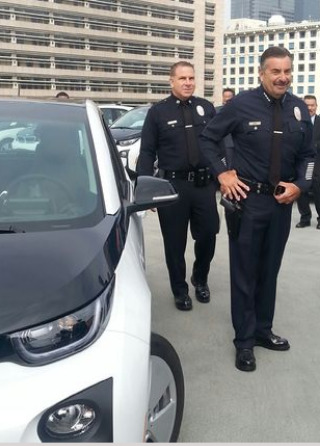 By opting to lease instead of purchase the 100 EVs, LAPD also was able to buy and install 104 charging stations.